I’m a big fan of the Grand Theft Auto and Saints Row series. Now I have a new favorite to add to my collection: Max Payne. I wasn’t a fan of the first two, mainly because there were other games out there such as Ratchet and Clank or Jak and Daxter that seemed more appealing to me at the time. All of my friends were talking about Max Payne 3 though, so I decided I might need to hop on board and try out the game. After purchasing the Special Edition for my PS3, I was very surprised at what I experienced: Max Payne 3 turned out a great shooting game that will keep anyone busy for hours. From the get-go, you can tell Rockstar really thought this thing out. 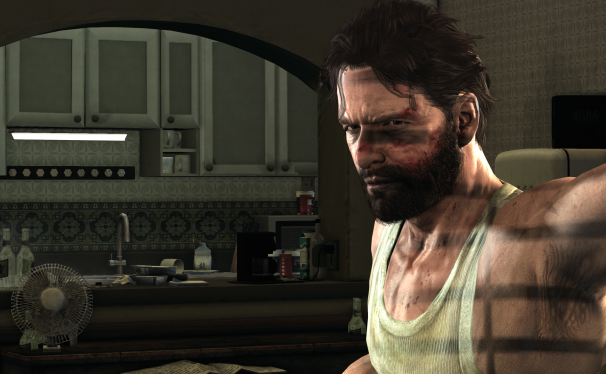 The game starts nine years after the events of Max Payne 2, where Max, now addicted to alcohol and painkillers, has moved to Hoboken, New Jersey. Max soon gets into a confrontation at a bar with Anthony DeMarco Jr., the son of mob boss. An old friend from police academy intervenes on Max behalf and is seeking to recruit Max as a private security contractor for a job in South America. Max initially resists, but seeing that he’s now murdered someone in a bar fight, Max reluctantly agrees to accompany him to Brasil. After this beginning the game really picks up in terms of intensity and difficulty. The story is easy to follow, and launches us into numerous battles that make the player feel truly immersed in the game. This isn’t groundbreaking territory for Rockstar, and they have once again managed to make a breakout success. The game’s visuals are, to put it bluntly, stunning. It’s obvious Rockstar worked very hard to make this game look perfect. Every edge appears properly aliased, and no pixels can be seen unless the player puts glues their eyes directly on the screen. The graphics are SO stunning in fact that it might be the only reason I opted to continue to play the game. Because after seeing gameplay videos of the game online, I didn’t think that graphics this good could come from a regular PS3. The game just looks spectacular. Gameplay is very solid as well. The controls are almost exactly the same as Grand Theft Auto’s, and it is easy to pick up and learn.When I was playing it, I did notice a few enemies accidentally killing themselves and each other. But ultimately the game’s performance, along with the video and sound, is very solid and almost stellar. Let’s wrap things up. From the sounds of the guns firing, to the soundtrack, to the graphical fidelity and solid gameplay, everything comes together to form an experience that both hard-core and regular gamers will love. Sarif Industries Website "Breached". New Deus Ex: Human Revolution Information Incoming?